The legendary singer Onnik Dinkjian, who is a member of the American-Armenian diaspora, has been one of the most prominent singers for Armenian communities around the world for sixty years. The Anatolian musical style that Onnik developed has become a historical source for ‘traditional Armenian music.’ His songs are a surviving record of a nearly-lost Armenian dialect of Dikranagerd, a region now located in southeastern Turkey, also known as Diyarbakır. 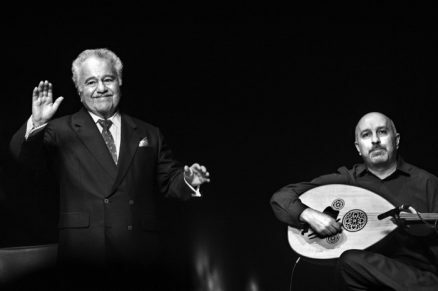 For this special concert he will be joined by his son Ara who is considered one of the great oud players and composer and is known for his work with Night Ark, the seminal East meets West band he founded in the 1980s. They will be joined by some of today’s most outstanding artists: Tamer Pınarbaşı on kanun (plucked dulcimer); Ismail Lumanovski on clarinet; Panagiotis Andreou on bass and Engin Günaydın on percussion.